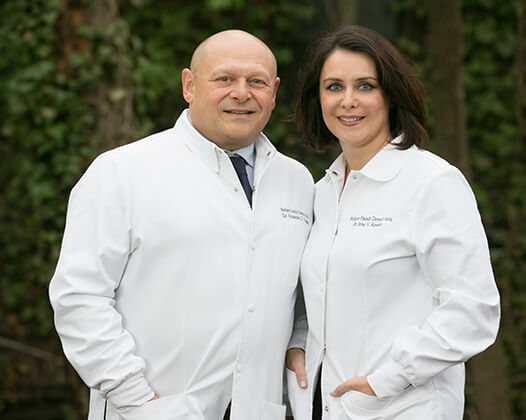 New York Family Dental Arts is led by Dr. Alexander Vaiman and Dr. Irina Kessler, a brother and sister team committed to offering only the best in high-quality, patient-centric dental care. Our practice is built on an artistic appreciation of beautiful aesthetics with a commitment to integrating the latest in state-of-the-art tools. We use the best techniques, materials and technologies to help patients achieve their dream smiles and attain truly magnificent results. And, our team works hard to exceed your expectations in customer service. Our office is conveniently located near New York-Presbyterian Weill Cornell Medical Center, Memorial Sloan Kettering Cancer Center and Hospital for Special Surgery, and our team of experts work together to offer a multitude of options to meet your every dental need. Some dentists try to do every treatment themselves, but the intricacies and training needed to responsibly administer higher-level dentistry is hard to come by. Each member of our team is exceptionally qualified to offer very specific care. What does it all mean for you? No more running around town from specialist to specialist to complete different phases of treatment, saving you time and money. Our office proudly accepts insurance on behalf of every PPO provider, and we work hard to maximize your benefits. Don’t have dental insurance? No problem! Affordable financing options are available through CareCredit® and The Lending Club. It is our goal to get you the expert dental care you deserve while working to fit it in your monthly budget. We believe everyone is entitled to enjoy a smile that lasts a lifetime, and finances shouldn’t ever get in the way of achieving that goal. As usual, my experience at your office yesterday was excellent. Your staff are all professional, pleasant and knowledgeable. The hygienist, Fran, always makes going to the dentist a pleasant experience with absolutely no stress and no pain. She communicates what she’s about to do so that I feel informed and there are no surprises and she is as pleasant as can be. I have recommended your offices to many co-workers and friends and without exception every single person has been totally satisfied by your office and your services. Keep up the good work! Pelham Family Dental Arts Dr’s and staff are awesome! I would recommend them to all my family and friends. What I like most about this office is that they really care about you and your health. I have been to other dental office that never informed me of any other options for my treatment. At Pelham Family Dental Arts I was able to get different options for treatment and NOT JUST WHAT MY INSURANCE SAID. I really appreciate the great service and honesty for the best treatment for me! I was in a foul mood when I arrived for a cleaning recently. But everyone in this office is so positive, upbeat and helpful that I ended up walking out feeling good not only about the care I had received but about the future steps I need to take to ensure these teeth last the rest of my life. Dr. Kessler is professional and incisive in her analysis of what needs to be done, and she had good advice about managing the costs through my insurance. This is a good team. Located at 340 East 72nd Street between First and Second Avenues, our office is a short walk from the New York-Presbyterian Weill Cornell Medical Center. Doctors, students and staff are welcome, as are residents from all areas of the Upper East Side. We know your time is valuable, so we make every effort to honor your appointment time and have you on your way, so you can enjoy the rest of your day on New York’s illustrious Upper East Side.